(Geneva, September 18, 2018) La Via Campesina and allies CETIM, FIAN and other organisations are in Geneva to engage, confirm commitments of and persuade member states of the Human Rights Council to support an international legal instrument to enable the effective protection the rights of peasants and other people working in rural areas. Since the 17th of September, the delegates will hold meetings with the country representatives here in Geneva until the 21st. All this is happening during the 39th Session of the United Nation Human Rights Council. The report on the 5th OEIWG, the revised declaration and the resolution, formally regarding the ‘Rights of Peasants and Other People Working in Rural Areas’ will be presented by Bolivia this week, on 19 September, within the UN Human Rights Council. Thereafter, the declaration will be submitted to the United Nations’ Human Rights Council member states for the adoption of the final text. The 39th session coincides with a historic moment in Switzerland as its citizens will vote on September 23rd in a referendum to include food sovereignty in their constitution. 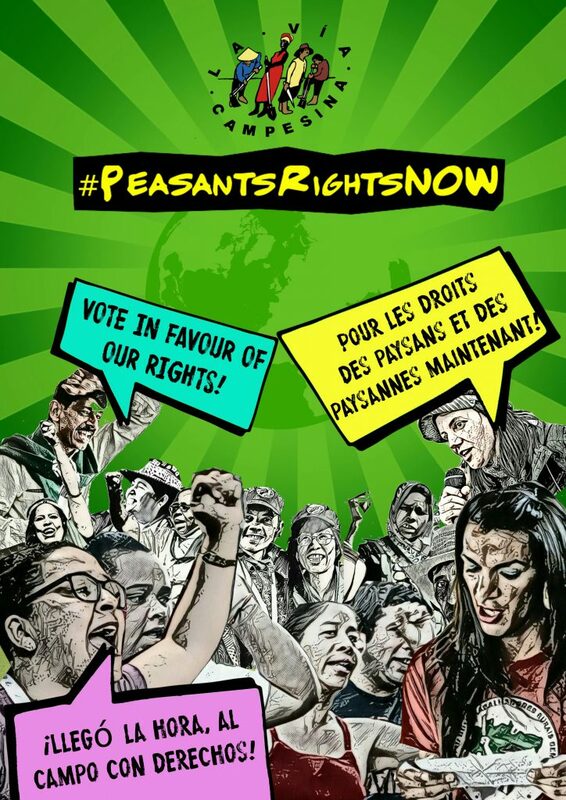 Uniterre (hosting the peasant rights delegation during this 39th Session), a member of La Via Campesina in Switzerland, has been campaigning for this for years. “Better protection of the rights of peasants and other people working in rural areas will make great contributions to building food sovereignty and a better society based on equity and equality”, says Zainal Arifin Fuat, La Via Campesina leader and peasant from Asia. The Bolivian Mission, together with other core support countries, is sponsoring this process and has always been instrumental to the success of the negotiations.